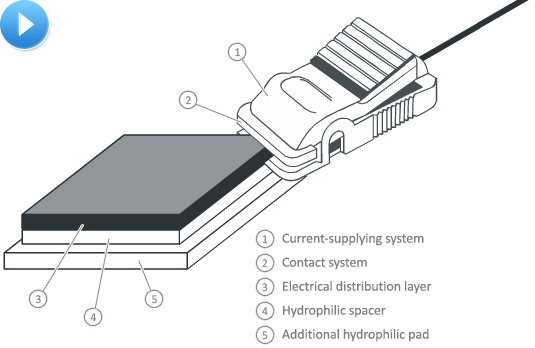 Surface electrodes are produced on the base of home-produced electroconductive paper, and it opened a prospect of single-use electrodes using in physiotherapeutic practice. New technologies allow making to order electrodes of all flat forms and sizes. What concerns electrical conduction, our electrodes don't differ very much from the materials, used in physiotherapeutic practice (graphitized cloth). Material is cut by scissors very easily, so, if necessary, a doctor (or nurse) is able to cut out required form of electrode all alone. Today we produce electrodes of all forms and sizes, used in physiotherapeutic practice. Electrodes in the moistened state cover patient’s skin very well, ensuring comfort when carrying out procedure. Fixation of electrodes to patient’s body is carried out by traditional methods (sacs) or elastic bandage. Current-carrying cable is used for connecting electrode to the unit. Current-carrying cable of electrotherapeutic unit is fixed at the electroconductive layer (grey). Current-carrying cables can be adapted to any physiotherapeutic unit. electrotherapeutic acepticity is guaranteed, parasitic ionic electrophoresis is excluded - it doesn’t achieved by traditional biomedical electrodes in full measure. Electrodes are produced on the base of home-produced electroconductive paper, and it opened a prospect of single-use electrodes using in physiotherapeutic practice. Electrodes have a two-layer structure: first layer (grey) is a current distribution layer, second layer (white) acts as a hydrophilous capping. Moistened electrodes cover patient’s skin very well, ensuring comfort when carrying out the procedure. Fixation of electrodes to patient’s body is carried out by traditional methods (sacs) or elastic bandage. WARNING! Prevent contact between current distribution layer and patient’s skin. Current-carrying cable is used for connecting electrode to the unit. Cable clamp is fixed at the electroconductive capping (grey).